Naked man found in van with a fire extinguisher in Vero Beach. 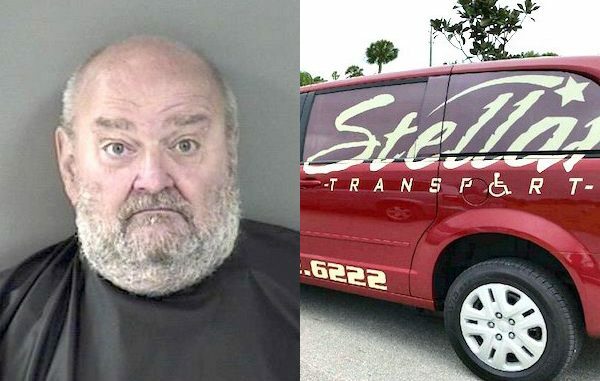 VERO BEACH – A 65-year-old man was arrested after he was found naked inside a Steller Transportation van with a fire extinguisher in Vero Beach. The Vero Beach Police Department received a call from a Bank of America employee who said someone was in a van naked in their parking lot. When the employee approached the van, the suspect jumped out and started yelling at them. Crayton Coursey was identified as the man inside the van by officers. Coursey told officers that he works for Steller Transportation in Vero Beach and had permission to be in the van. Officers called the owner of the company who said Coursey was not an employee and had no permission to be in the vehicle. While inspecting the vehicle, officers noticed the interior was vandalized with white powder from floor to ceiling. For some reason, Coursey discharged the fire extinguisher in the van. Coursey was arrested and transported to the Indian River County Jail where he was booked on charges of felony burglary of auto. He still remains in jail with bond set at $20,000. In January, Coursey stole a motorized shopping cart from Publix and drove it to the Sebastian River Medical Center where he created a disturbance.